Evrerything work's great but I need to add extra language and voice,how to do it? But the language and voice guidance that I want is not there. Does it have the ability to add language and voice guidance? For example, Albanian. 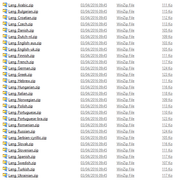 I have these files but need little help, how to add on the system? the link viewtopic.php?f=82&t=922 it's only the gps map and not anything else. And please let me know ,why I can't read some post? Under the message write "You do not-have the required permissions to view the files attached to this post." you are in the gold group and you can download all the software without exception. yes i found there was a png image insertion problem, i will fix this problem and thank you for reporting it.